So I had the opportunity to see the Met’s new Tristan und Isolde on Monday night. This is only the second time I’ve seen this opera live – or, rather, it’s sort of the first-and-two-thirds time, because the first time I went to see it, in Vienna, I misapprehended the schedule, arrived late, and was directed to the Opera Detention Area where I had to wait and watch Act I on a video feed until the intermission. This production by Mariusz Treliński is grim. It opens with projection animation, a repeatedly inscribed glowing green circle on a black background – like radar or sonar on a ship – and through this we see, in reversed black and white, film-negative-style, crashing waves and the prow of a warship. Tristan and Isolde are on a modern military ship, with low gray rooms, outfitted in metal, and a very clangy metal staircase to one side. 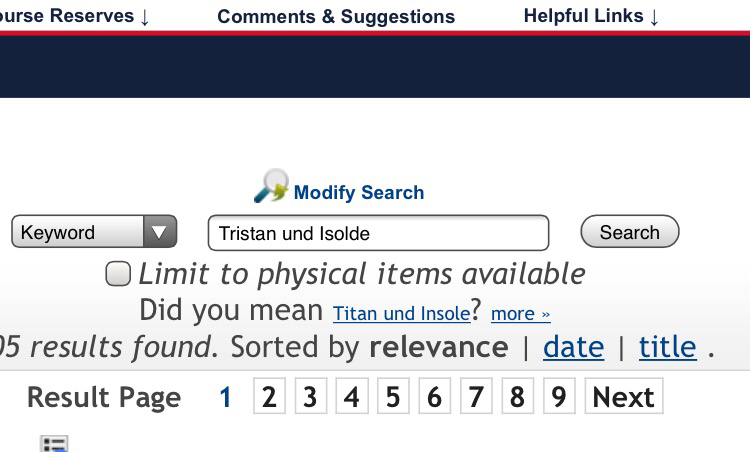 Tristan can see Isolde and Brangäne via a video feed projected onto the wall of the control center that makes up the uppermost level. There is a consistent feel of descending into ever darker levels as the story unfolds – when Tristan finally agrees to go and talk to Isolde in Act I, they go downstairs to the very belly of the ship; in Act II, they meet almost outdoors, in an observation area, but soon go down again, into the cargo hold (it is a cargo hold – there is cargo, even, and King Marke makes his entrance through the rear doors in a cloud of light and vapor; the effect is somewhere between Das Boot and Star Trek: Deep Space Nine) and in Act III, Tristan awaits death and Isolde in a dark, cavernous hospital room. Sometimes the stage disappears behind the animation – in Act II, as Brangäne (Ekaterina Gubanova) warns the two of danger, we see rushing clouds, and ultimately the (often repeated) image of a solar eclipse. Act III, which depends on Tristan being excellent by himself for about an hour and which can thus go wrong quite easily, is broken up visually by a move from the black hospital room into a burned-out hut as Tristan muses about his past. This part can drag on under some circumstances – we want Isolde to show up almost as much as Tristan does – but in this case it doesn’t, because Stuart Skelton is so consistently good. I have listened to recordings of this opera and felt, by Act III or so, that I had had rather enough of tenors in distress for one evening, but this was emphatically not the case on Monday night. Nina Stemme was also very satisfying as Isolde. It’s interesting hearing this opera live as opposed to on CD – on recordings, the voices are often placed a little bit more forward; in a live performance, even a big voice like Stemme’s gets drawn into the orchestral music at climactic moments, which I find I don’t mind. The show was stolen by René Pape as King Marke, however. His long soliloquy in Act II had a dramatic force that stood out from everything else I heard that evening. The Met’s orchestra with Simon Rattle also outdid itself – the wrenching musical tension in the score was vividly expressed. Rattle held the final chord longer than I expected, but very effectively. (And no one interrupted with premature applause!). 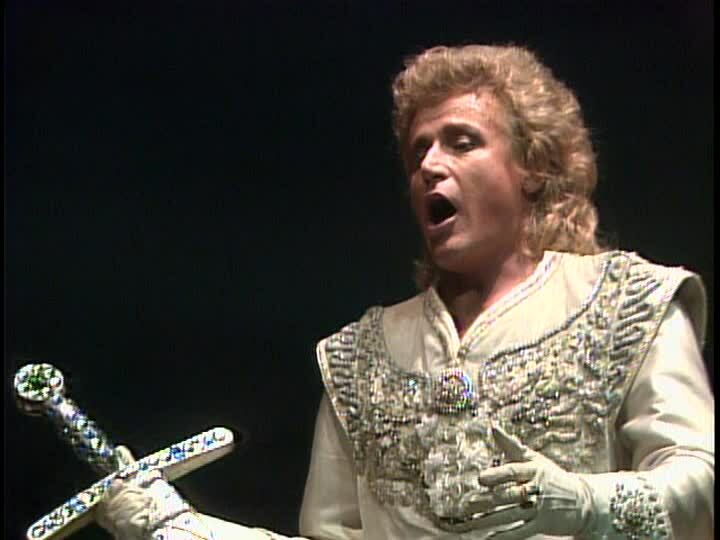 Led by some excerpts on one of Karita Mattila’s recital CDs and one too many evenings with Tristan und Isolde, I watched a 1980s Met production of Lohengrin because it was the only one that the library has. The hair was a little big for my taste, but at least I know what the whole thing sounds like now. By the end of this opera, both the women are either dead or banished and the Duchy of Brabant is in the mature hands of a twelve-year-old kid. Order has been restored, I guess. Then again – perhaps this is just me – when I am told that the opera takes place in Belgium, something in me knows from the get-go that this is probably not going to turn out well. (The scene is given as Antwerp, which is in modern-day Belgium, but the medieval Duchy of Brabant if I remember correctly included areas that are now part of the Netherlands). Wagner: worse than the Crimean, apparently. Then again, Tennyson’s taste was always questionable. Also, did you know that the startle reflex of an armadillo is to launch itself straight up into the air to about the height of the bottom of a car, and that’s why you so often see dead ones on the road? I did not hit any deer, but I may stick to string quartets and Handel recitals for driving in the future. 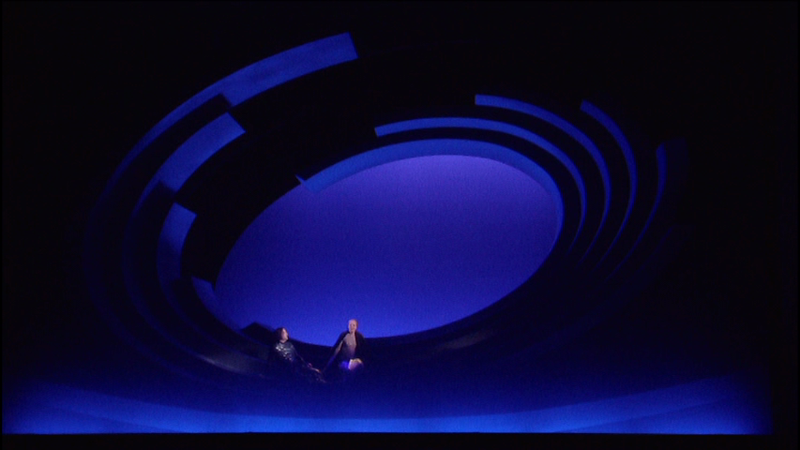 This production from Glyndebourne of Tristan und Isolde resembles the last one that I saw in that the visuals are simple. Which makes sense; this does not strike me as an opera that would work well with a lot of visual clutter in it. (Having lots of stage clutter is often linked with humor, isn’t it? I’m thinking particularly of Doris Dörrie’s Cosí fan tutte which was great fun but sort of exhausting at times. Or in other cases – a certain much-googled DVD of Handel’s Alcina comes to mind – it’s less humor than a kind of directorial ADHD.) But to return to Wagner, there is even less in the way of stuff on stage here than there was in that Met version, even though the lighting and general general setup of the Met’s version felt more spacious than this. Last week, I went looking for recordings of Strauss’s Die Frau ohne Schatten so I could hear a little of it before seeing the actual show. I did find a complete recording in the library, and I also found one of Deborah Voigt’s recital CDs, “Obsessions” that had bits of that opera, some other selections of Strauss, and some Wagner. In the end, I didn’t listen to the complete recording of the Strauss opera at all, because I got distracted by Voigt, both the Strauss and the Wagner, which turned into listening to Kirsten Flagstad singing various selections from Tristan und Isolde which turned into spending today watching a DVD of a performance of Tristan from the Met in 1999, with Ben Heppner as Tristan and Jane Eaglen as Isolde. Some of these itineraries that Kayak, Orbitz, Cheaptickets, etc. are suggesting are so bizarre. Color me skeptical, but I am fairly sure one can get from New York to Vienna in less than 21 hours. Far less than 21 hours, in fact. Not necessarily what you would call a high quality critical opinion, though. I just finished watching that DVD of Der Fliegender Holländer, of which more later. I am always mildly surprised whenever I find myself enjoying Wagner, because he and I got off to a kind of rocky start. My first encounter with his music was the march of the Meistersingers from Die Meistersinger von Nürnberg. We played it in high school orchestra for graduation every year – I rather liked it. So one day at the age of twenty I sat down with a brand new recording of the opera, purchased from one of those record stores that used to exist not on the internet, and expected to enjoy it. I gave up after about two hours thinking that this was quite possibly the most annoying thing I had ever experienced in my entire life.